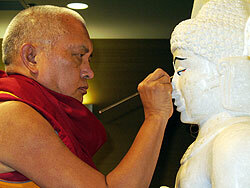 Lama Zopa Rinpoche continuing opening the eyes of the Buddha statue in the International Office lobby. Rinpoche will teach at the Kopan November course in December. CPMT will be in late April 2009! More details coming soon. 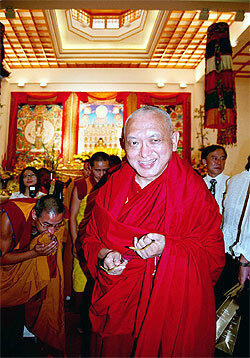 Rinpoche at the opening of Amitabha Buddhist Center’s new building, Singapore; May 2007. You recite this 7 times and blow under your shoes. It is mentioned in the text to blow under your feet but I think shoes have the direct contact to the creatures. Anyone who died that day under your feet gets reborn in the Deva realm of the 33. But of course this does not mean you go to step on every insect you see in the sky or under the ground, on the ground, in the water, HA HA HA HA. [This advice] is for if it only happened unconsciously, not intentionally. It is good to do this when going for walk also because there are our dear precious ant aunties, other even smaller mother sentient beings. You can do the same for the car wheels; you can spit over them after the recitation. Spit all way around. I wish everyone to have happiness and success. Remember everyday Buddha, Dharma and Sangha with strong devotion from the heart. Try to abandon all negative thoughts. Every day check your mind and what thoughts are there and then think: “I will never develop jealousy, pride, attachment and anger. Especially I will not criticize others; in particular I will not criticize Sangha.” Criticizing Sangha generates more negative karma than anything else because Sangha represents Buddha, Dharma and Sangha, everyday. Let’s try everyday to be honest and kind, to have always the thought in the mind to serve Buddha, Dharma and Sangha, and to serve all mother sentient beings. Sadly, Losang Chogyel Study Group in Guatemala has closed. Thanks to all who helped the group during its 5 years of benefiting beings! 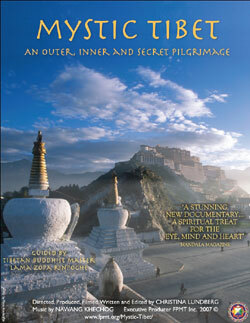 At long last, the documentary DVD Mystic Tibet is in the final leg of production. To preview the trailer, go to FPMT Streaming Videos. This spiritual adventure follows Lama Zopa Rinpoche and fifty pilgrims as they visit many sacred sites in Tibet, including Milarepa’s meditation cave and the Jokhang in Lhasa. This intense journey explores the culture of Tibet and the spiritually rich landscape in a way that is not often seen. experience of Rinpoche with their members. The DVD will be available through the Foundation Store soon. Please watch for an announcement in the Foundation Store newsletter. Go to the Foundation Store newsletter subscription webpage if you are not already receiving this monthly update. Wholesale discounts are available to authorized wholesale distributors. All Basic Program and Basic Program Homestudy information on the FPMT website has been updated this month. New BPs include Oseling, Spain, starting next January with Ven. Nerea Basurto, a Masters Program graduate as resident teacher, and the BP homestudy courses to be offered by Liberation Prison Project and the Czech Republic’s Dompipa Study Group! The first Basic Program homestudy completion cards have been sent out to students of this program who are motivated to make use of the certification option. They received a digital version of their cards with their first subjects signed off! The second Work a Day for Rinpoche campaign was a tremendous success! At this point over $112,000 has been donated. FPMT Taiwan combined the efforts of all the Taiwanese centers and projects to raise $30,000. Please join us in rejoicing in the tremendous generosity and support demonstrated by everyone connected with the campaign. Thank you again for your wonderful support and kindness. To view a partial list of the more than 2,400 supporters, please see the Donors Page. There will be an announcement concerning the disbursement of the funds following the collection of all donations. Lama Zopa Rinpoche reading the latest issue of Mandala magazine at home in California. The December 2007-January 2008 issue has a behind-the-scenes look at what else went on in that historic week in October, when President Bush presented the Dalai Lama with the US Congressional medal. In other stories, a doctor tells how he practices Emergency Buddhism; advice for the ‘new adult’; and Jan Willis talks about how one faith can enhance another. Look for your issue this week! currently participating in this wonderful program, there is still time to practice Merit Box generosity for 2007! Visit the Merit Box Webpage for information. We would like to send a heart felt Thank You to all the coordinators from the different centers and to all the people participating in this program of generosity. Your actions will preserve the Mahayana tradition long into the future. Lama Zopa Rinpoche recommends that all FPMT centers and projects fly the Lama Tsongkhapa prayer flag and the Gyaltsen Tsemoi Phugen prayer flags. The prayer flag of Lama Tsongkhapa is especially auspicious; it prolongs the stainless teachings of Lama Tsongkhapa. The prayer flag of Gyaltsen Tsemoi Phugen removes obstacles and promotes harmony. Rinpoche also recommends that all FPMT centers have a statue of Lama Yeshe, the kind and peerless founder of FPMT, on the center altar. This statue and the protection of these prayer flags will help obstacles to be dispelled and the teachings of Lama Tsongkhapa to flourish. “I didn’t know the [Heart Shrine] Relic Tour would be of such great benefit to the world, create such devotion. For example, a child went to see the relics; the father was Christian and waited at the door, looking negatively at the relics but didn’t stop his child going in. Then the child pushed him in and at the first relic this father had some great experience, really changed his mind in a positive way, which is what is needed for the world. I think this is Buddha’s action, working through the relics to benefit sentient beings, Buddha giving blessings to people through the relics. People enjoy the relics so much, generate so much devotion. Devotion is the source – from devotion you get blessings, from blessings you get realisations, the strength to engage in the path. From Ven Fabio, our Spanish national coordinator writes: “Buddhism has been recognized by the Spanish government as an official religion. About the implications for centers….it means that we will start official negotiations with the state in order to get financial benefits and to recognize Sangha as “religious ministers/priests”. New opportunities include Director of the Lotsawa Rinchen Zangpo Translator Program; Spiritual Program Coordinator at Mahamudra Center, Coromandel, New Zealand and Manager at Milarepa Center, Vermont, USA.